I read Emily St John Mandel's post-apocalyptic novel Station Eleven during my holiday — perhaps a questionable choice for a trip that involved air travel, but ultimately appropriate for a week when I was surrounded by beauty and frequently reminded of the world's abundance. The novel is about the Travelling Symphony, a touring group of actors and musicians who perform Shakespeare in a world irrevocably changed by a pandemic. It’s also about the disease’s outbreak twenty years before, and how a series of characters — a training paramedic named Jeevan; a young actress named Kirsten; Arthur Leander, a movie star returned to the stage for a production of King Lear; Miranda, a comics artist who was once married to Arthur; and Miranda and Arthur’s friend Clark — deal with the end of the world as we know it in the past and present time. I liked the shifts between the present post-apocalyptic world and the world of the past, and I also liked the fact that Station Eleven has a large cast of characters. It allowed Mandel to focus on a wide range of reactions and behaviours, and it made the novel all the richer and more powerful. My favourite thing about Station Eleven is that although it’s far from naive about social collapse scenarios, it doesn’t share certain assumptions about “human nature” revealing itself once the thin veneer of civilization falls away that are common in disaster stories, and which I find questionable at best and harmful at worst. The world of Station Eleven is devoid of formalised laws and institutions to enforce them, and of course this has consequences to everyday life. Nevertheless, this is a world where killing another human being to save yourself is still a big enough deal that people come up with rituals to mark the occurrence — an active act of resistance to seeing it as commonplace. The story acknowledges that a wide range of behaviours and ethical choices would continue to be possible in such a world; that humans might very well go for peaceful cooperation because — surprise — it would help us survive; and, most importantly of all, that even in a post-apocalyptic world “survival is insufficient”. There were no dubious assumptions about Maslowian hierarchies at work in Station Eleven, and that felt like a breath of fresh air. 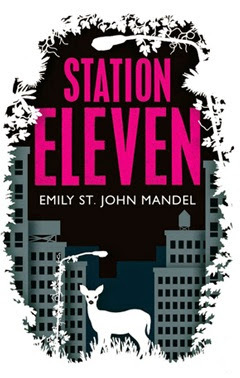 A few weeks after reading Station Eleven, I had the chance to see Emily St John Mandel read from and discuss the novel during her brief UK tour. Hearing her read the passage that ends with the quote “because survival is insufficient” (the Travelling Symphony’s motto) was more moving that I’d have liked at an event attended by a total of twelve people. Mandel said she was very much interested in writing a story that covered not the territory immediately following a major societal collapse, but rather what came afterwards. This is the reason for the twenty years gap between the novel’s two timelines: while the immediate aftermath of disaster has been thoroughly covered in fiction, we don’t get as many stories about humankind’s slow recovery, nor about the kind of lives people would lead after such unimaginable losses. Regarding the novel’s elegiac tone, Mandel said she wanted to write a sort of “requiem to the world we live in” — a reminder of what we take for granted. Regardless of all the problems that afflict the modern world, things like antibiotics and electric lighting and our ability to travel so easily and communication technologies are everyday miracles, and this is something we sometimes forget in our anxiety. She also wanted to examine what it would be like to remember a world where these things were commonplace and then have them disappear. The older characters would suffer more acutely in this regard: the more you remember the more you’ve lost, and memory can easily become a burden. In response to an audience question (and I’m so glad she said this, because I was a bit flabbergasted that someone would even suggest it), Mandel said she’s very wary of rose-tinted readings of her post-apocalyptic world as superior to the world we live in. As much as you could argue that a pandemic would, say, halt climate change, the suggestion that the world would be “better” if 99.9% of people died makes her deeply uncomfortable. The world she writes about is also one where life expectancy has plummeted dramatically, and where diseases we now have under control would become fatal again until someone rediscovered the cure. Losing that many people would also mean that certain skills and knowledge would be lost — if not irrevocably, then at least for a very long time. This isn’t to say the world of Station Eleven is unrelentingly dire or that everything was lost, but framing it as better seems strange (or — my words — staggeringly insensitive and tactless). She’s also resistant to the idea that post-apocalyptic fiction is a response to anxieties that are exclusive to the modern world. She doesn’t want to minimise the unprecedented threat that is climate change, but history shows us that humankind has felt that the end of the world is imminent for a very long time. A recent example is the Cold War and the everyday threat of nuclear warfare. And if you look back to Shakespeare’s time, which she researched extensively to write the novel, you spot several parallels between his plague-inflicted world and the pandemic in Station Eleven. The feeling that our lives are fragile is anything but new, and people have been responding to it in different ways for a very long time. 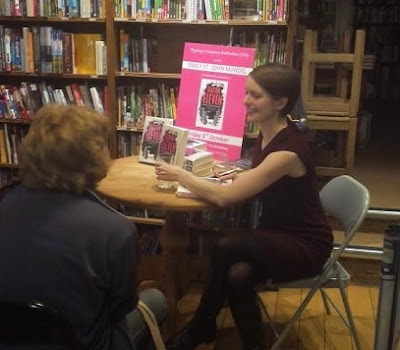 As I said above, the event was small enough to verge on the awkward, but I really enjoyed hearing Emily St John Mandel speak all the same, and having gone added to my appreciation of the novel. No more fire departments, no more police. No more road maintenance or garbage pickup. No more spacecraft rising up from Cape Carneval, from the Baikonur Cosmodrome, from Vandeburg, Plesetsk, Tanegashima, burning paths through the atmosphere into space. No more Internet. No more social media, no more scrolling through litanies of dreams and nervous hopes and photographs of lunches, cries for help and expressions of contentment and relationship-status updates with heart icons hole or broken, plans to meet up later, pleas, complaints, pictures of babies dressed up as bears or peppers for Halloween. No more reading and commenting on the lives of others, and in so doing, feeling slightly less alone in the room. No more avatars. On silent afternoons in his brother’s apartment, Jeevan found himself thinking about how human the city is, how human everything is. We bemoaned the impersonality of the modern world, but that was a lie, it seemed to him; it had never been impersonal at all. There had always been a massive delicate infrastructure of people, all of them working unnoticed around us, and when people stop going to work, the entire operation grinds to a halt. No one delivers fuel to the gas stations or the airports. Cars are stranded. Airplanes cannot fly. Trucks remain at their points of origin. Food never reaches the cities; grocery stores close. Businesses are locked and then looted. No one comes to work at the power plants or the substations, no one removes fallen trees from electrical lights. Jeevan was standing by the window when the lights went out. This is one I'm very curious about (and apparently Donna Tartt recommended this to Ann Patchett!) and I'm so glad you had a chance to meet the author too! I'm dying to read Station Eleven -- I love the idea that people would keep on caring about the arts. Because of course they would! But at the same time, that's not something I've seen much of in post-apocalyptic-type books that I've read in the past. There's often like one wise person who still has all the books, and everyone else is running around with knives and bombs. Putting the arts in a central position in this new world is really intriguing to me. Absolutely loved this book - so elegantly done. I would love to hear her talk about it - sounds a great event. I'm not sure this book is for me but it's getting such great reviews I feel like I must give it a go. Debi: It's beautifully written and I think you'd like it a lot. Sakura: Well, I wouldn't say "meet" as I was too much of a wuss to say anything :P But I was there! Jenny: Yes, yes, exactly! That's what I loved about it - the arts are not just the quaint remains of a former time that one single wise person clings to, but a human need. Annabel: "Elegant" is the perfect way to put it! Kathy: I hope you give it a go - you might be surprised! I really need to read this one. Every review I read gets me more and more excited about it. Like Trish, this review makes me want to read it even more, and it was already on my wish list. I absolutely loved this book, and generally love her. I met her a couple of years ago when she was promoting The Lola Quartet. I was so thrilled that she even got a one page spread in EW about a month ago. This girl deserves all the success. That last quote pleases me greatly. It's a shame there weren't more people at the event though. Trisha and Jeanne: Enjoy and let me know what you think! Sandy: I had never even heard of her before this book, so I was delighted to find out she has a backlist for me to explore. Which one of her other novels do you think I should pick up next? And yes, she deserves all the success indeed! Judy Krueger: Such a good book, isn't it? She's amazing and I can't wait to read more of her stuff. I finished the book a couple of hours ago. To a certain extent it felt like The Walking Dead (the tv series, haven't read much of the comics) to me in a more gloomy but hopeful outlook after the flu. I loved that it was hopeful, human, instead of let's say Cormac McCarthy's characters in The Road. I also loved the shifts in perspectives. If I were to draw plots, I'd put Arthur Leander in the center and connect him to everyone, one way or another. Though I was hoping for Jeevan and Kristen to meet, somewhat. I've yet to put my thoughts together. I just scrolled through your post and gleefully read the part you saw the author live (no matter how awkward, with the very few people in attendance) to the reading. And this post is 2014. It's nearing the end of 2016. Life. Have a great weekend, or what's left of it. Have a better week ahead, hopefully.